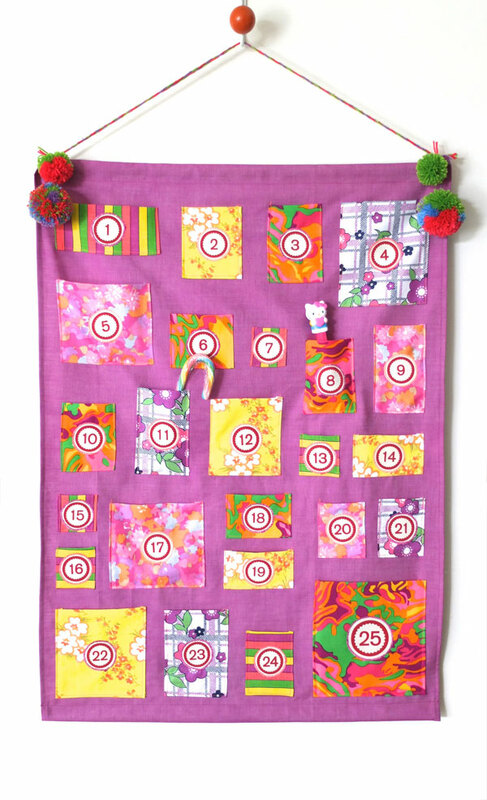 I remember with great fondness the little cardboard Advent Calendar my sister and I had as children. It was a little village scene where the tiny doors and windows opened up to reveal a new picture every day. It didn’t contain treats, but my sister and I would still fight over who was opening the doors. I’m sure mum still has it somewhere, the glitter has probably all fallen off though. With Emma getting older, I thought it would be fun to start our own little Advent Christmas traditions. Because it’s summer here in Australia at Christmas time, I’ve never much related to the traditional red and green regalia associated with this time of year. 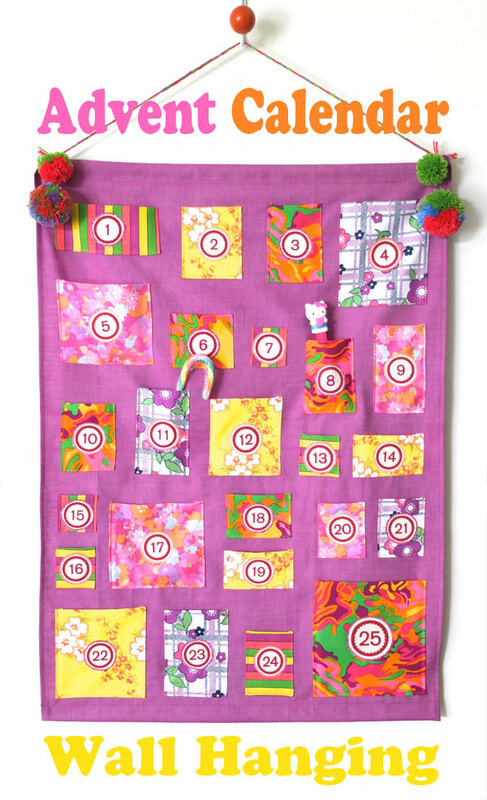 A summertime Christmas should be celebrated with loads of colour so naturally I gathered some of my brightest vintage fabrics and got to work making this Advent Calendar Wall Hanging. 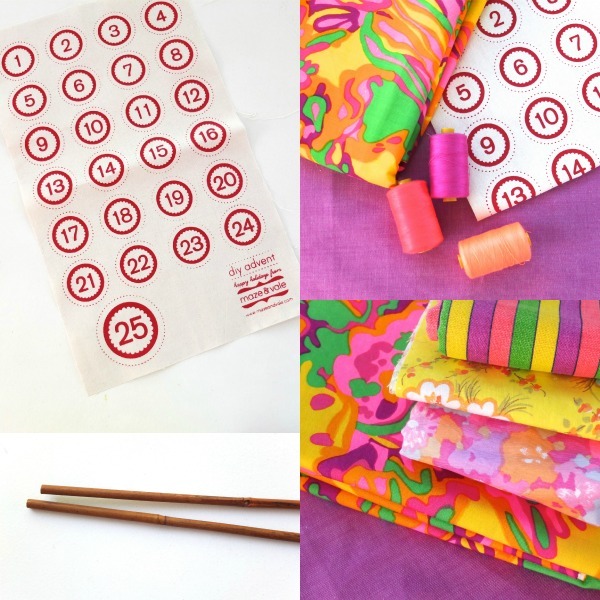 It’s fairly simple and can be adapted to any colour scheme depending on the fabrics you choose. 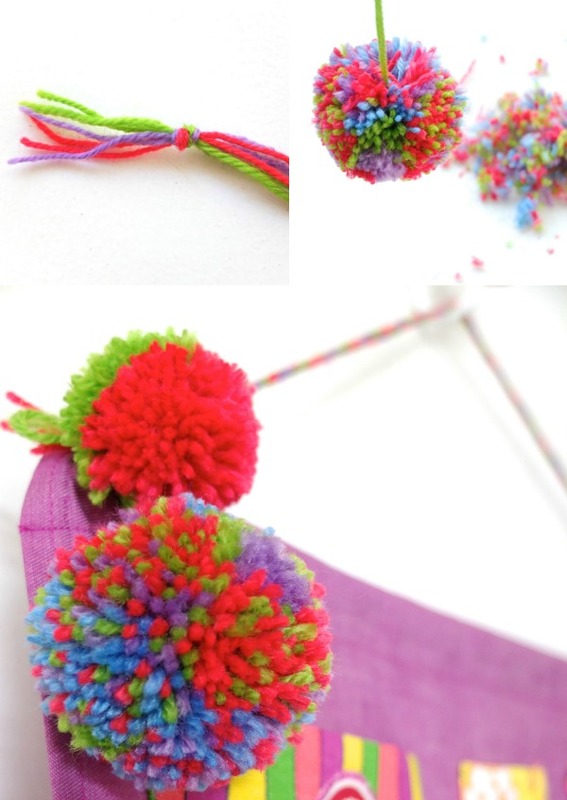 Add some pom poms for a little extra zing! 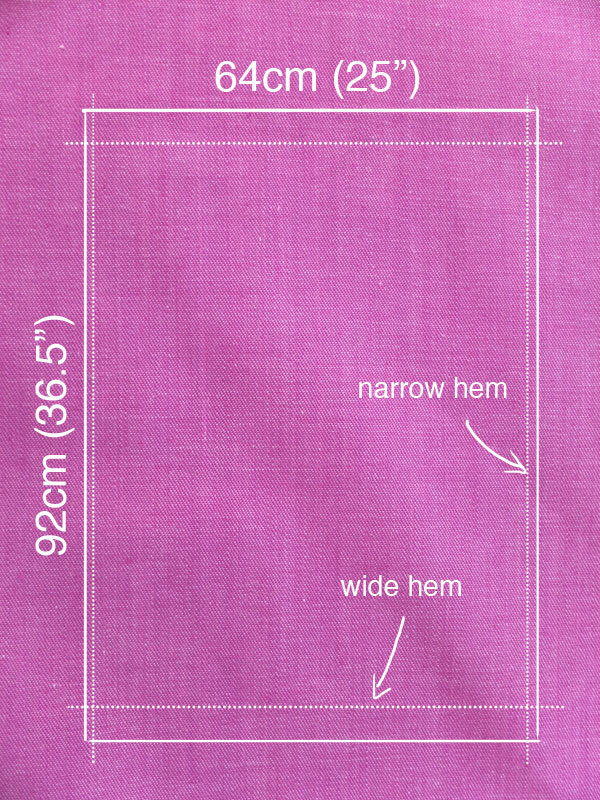 Mid/Heavy weight cotton fabric for back (denim is ideal) 64cm (25″) x 92cm (36.5″). You can change the size to suit your space. 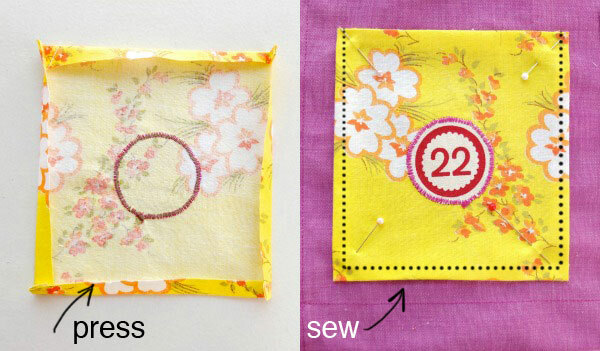 Press and cut your backing fabric to size. 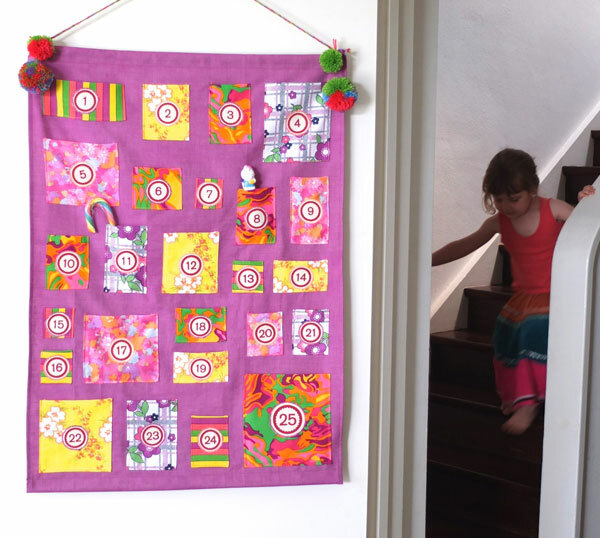 I have used the full width of the fabric as the height of the wall hanging. This was a vintage piece of fabric with some stains that were covered up nicely by the pockets. 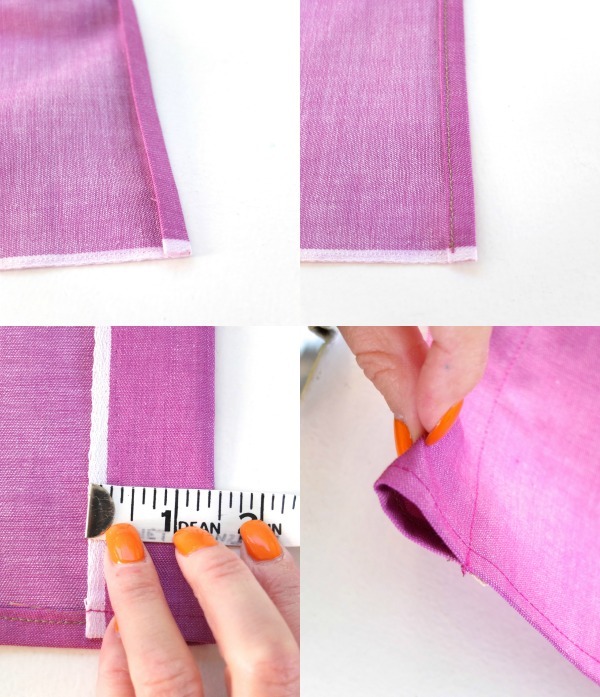 Hem the side seams, first using your iron to neatly press a 1cm (1/2″) double fold, then stitch. Hem top and bottom, leaving ends open to insert poles. I’ve made the width of the top and bottom hem about 1.5″ wide. 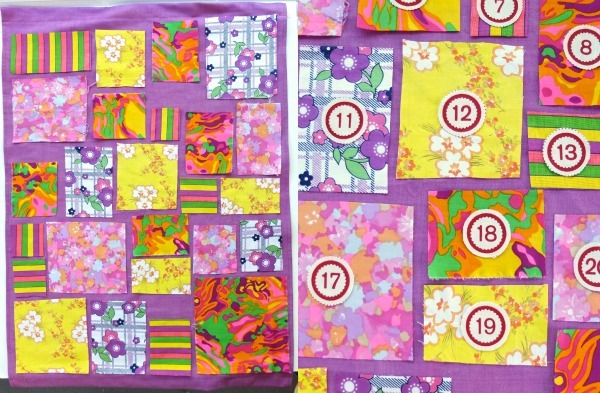 From assorted fabrics cut out 25 square and rectangle shapes for your pockets. They should vary in size, but remember to allow a 1cm (1/2″) seam allowance so cut them a little larger than your intended finished size. I just did a bit of freestyle cutting and moved the pockets around till I was happy with the overall balance. 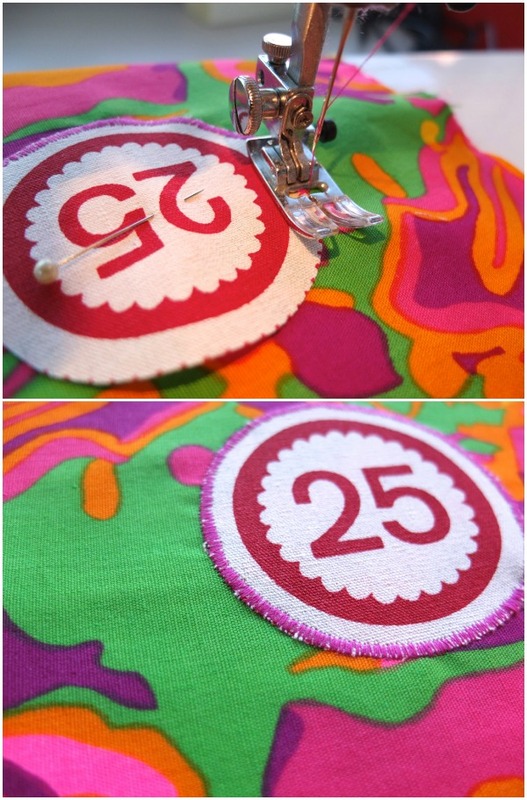 Cut out numbers and place one on each pocket. 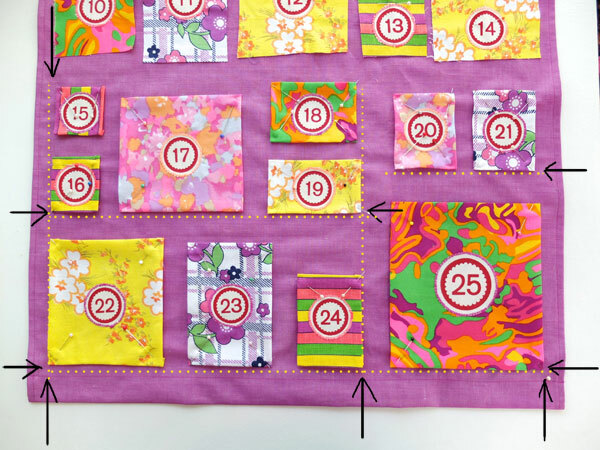 Sew the numbers to the center of each pocket front using a wide but closely spaced zig zag stitch. Iron the edges of the pockets over towards the center and pin on backing fabric in desired position. Sew around dotted line. To get a good visual balance, I’ve tried to align the pockets either vertically or horizontally, working from the outside in. 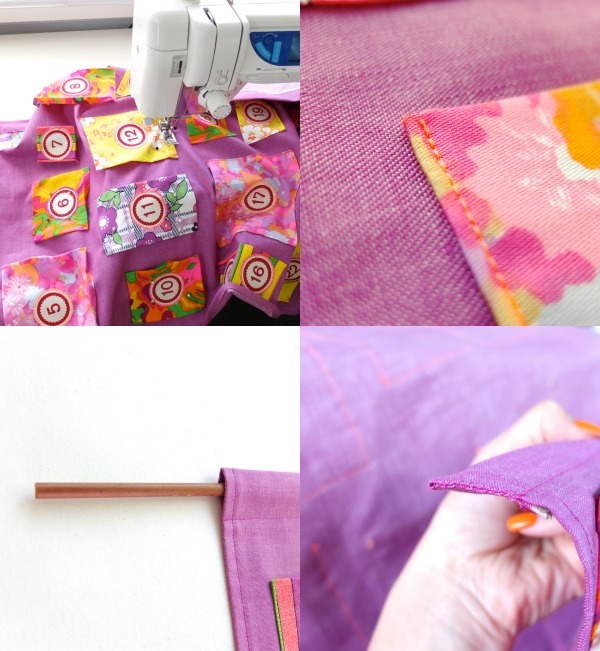 Sew on pockets, making sure you double stitch the start of the seam at the top opening of the pocket. Insert rods into top and bottom hems and whip stitch closed. 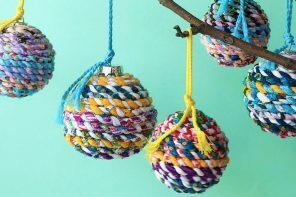 Braid yarn into a long cord (or use pre-made cord) and make some pom poms if desired. 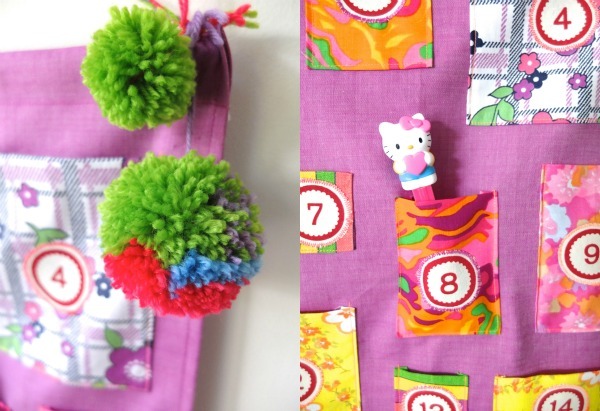 Sew onto the top corners of hanging. All done! 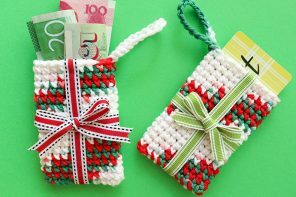 Time to fill those pockets with goodies! Emma is already super excited about the potential treats in store, although I’ll keep the sweets to a minimum and will include lots of fun activities as well. I’m sure she will love the pony stickers (it’s all about ponies these days), and I totally cracked up at the walking teeth. Her first Pez dispenser and a glow stick. 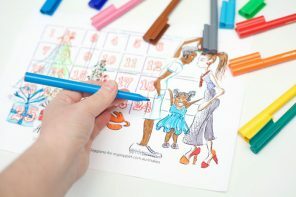 Other activities that may be fun to add will be, making Christmas decorations, making gifts for special friends, writing letters to Santa and Christmas cards…I’m sure I’ll think of many more. 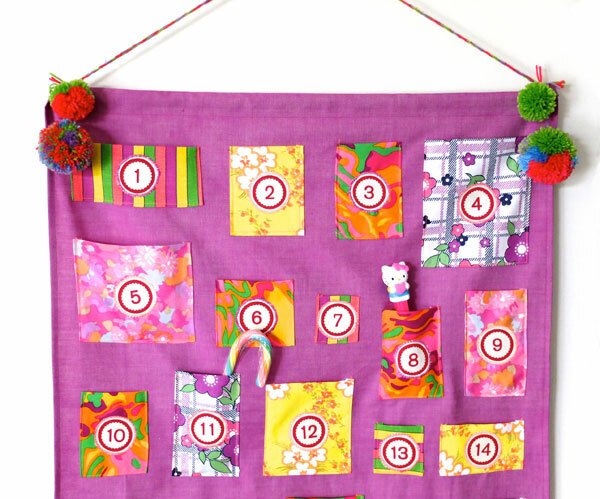 What’s your favourite Advent Calendar treat or activity? I’d love a few suggestions. I love the bright colours. We went with non-traditional colours too. Our Advent Calendar is mostly activity based. 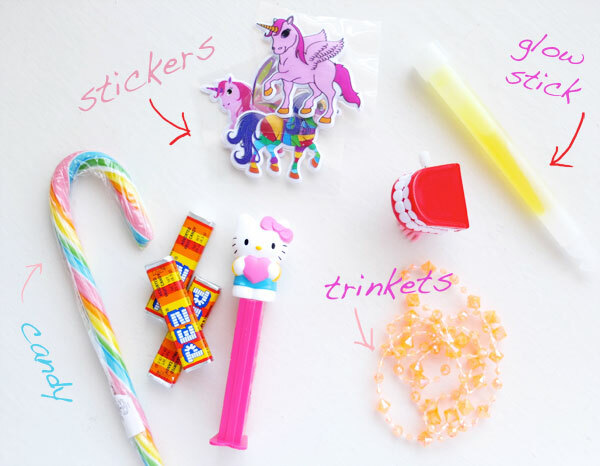 I’ve listed a few blogs in my post that have great ideas for each day. Thanks Laney, I just saw yours, love the beach theme, nice and summery. Lots of great ideas too. Love activity based treats, I hope my stamina holds up till the end of the month. Thanks Pippa. You could add some cute tassles! so pretty. i love these unconventinal colors and pattern. and the pompoms of course. Teria algum problema eu copiar a sua idéia aqui em casa pra minha família? No Brasil não há tradição de nada….Eu amei as cores e também acho, que em país onde o Natal acontece no alto verão , como aqui no Brasil também, cores bem alegres são mais reais com o clima. hoje estamos no inverno com temperaturas de 9 graus, mas no verão chegamos a 45 graus na sombra.UHUUUU! haja água. Adoro seu país. 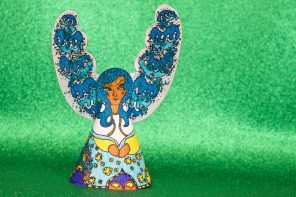 Tenho muita vontade de conhecê-lo….Deve ser muito colorido pela alegria e obrigada por compartilhar conosco suas idéias. I would have a problem copying your idea here at home for my family? In Brazil there is no tradition of anything …. I loved the colors and I also think that in a country where Christmas happens in high summer, and here in Brazil too, colors are more real and lively with the weather. Today we are in winter with temperatures of 9 degrees, but in the summer we reached 45 degrees in sombra.UHUUUU! there is water. I love your country. I really want to meet you …. It should be very colorful with joy and thank you for sharing your ideas. 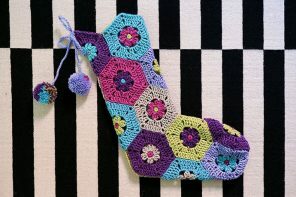 Thanks Giselle, yes you can make one for your home. The bright colours are perfect for Brazil! I would love to see a photo if you do make one.